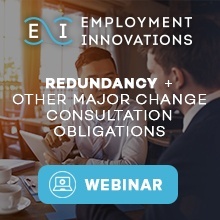 In this six part series of webinars, Peter Ferraro (Managing Solicitor at Employment Innovations), will go through some of the key Australian laws around Employment that every business needs to know. He will also share action points to ensure you are mitigating your risk and complying with Australian employment law. Peter Ferraro, EI’s Managing Solicitor, has over a decade of experience in employment/industrial law and workplace mediation, negotiation and dispute resolution. He leads our team of workplace solicitors and strives to provide practical legal solutions for corporate clients of any size. He strongly prioritises prevention over cure by consistently giving clients the advice necessary to minimise the legal risks and costs that govern Australian businesses. Peter is also a regular commentator, shedding light on employment law related topics. He’s appeared on Sky Business News, Channel Seven’s Sunrise and The Morning Show.